If you have any questions or want to enquire about dates, use our form to contact Jane Madigan or see their website for more information. You are hardly aware of it but you are on an island and out there is the Atlantic with the mountains of Kerry forming part of the view; if you are not inspired by this landscape then you have no soul. The modern cottage is stone built and sturdy, with a large gravelled area at the front… a plain enough exterior, but step inside to find a place of gleaming laminate floors and all the bleached beauty of the beach. In the large sitting room there are stones, driftwood mirrors and lamps, heavy wooden table tops, sheepskins and shaggy pile rugs, and an open fireplace with a pyramid of logs. Next is a sun room with wraparound windows and remote control blinds, which you operate from the comfort of two enormous sofas in tasteful grey. The state-of-the-art kitchen has a super table and black upright chairs. Upstairs: spotless wooden floors, big beds, clean white walls, stylised pieces of furniture and tiled bathrooms. A terrace to the rear has small lights set into wooden sleepers and leads to a stone platform with a grey slate table and benches… have your meals watching the sea and the sky. Minimum stay: 3 nights. 3 nights on weekdays. 3 nights at weekends. 3 nights in high season. Children over 16 welcome. Short breaks available. Restaurants in Sneem & Kenmare. 3-nights from €660 weekdays, 3-nights from €750 weekends. Have you visited Seal Rock Cottage? Be the first to leave a review. On an island, separated from the mainland by an old stone bridge, Seal Rock Cottage is a little piece of heaven! 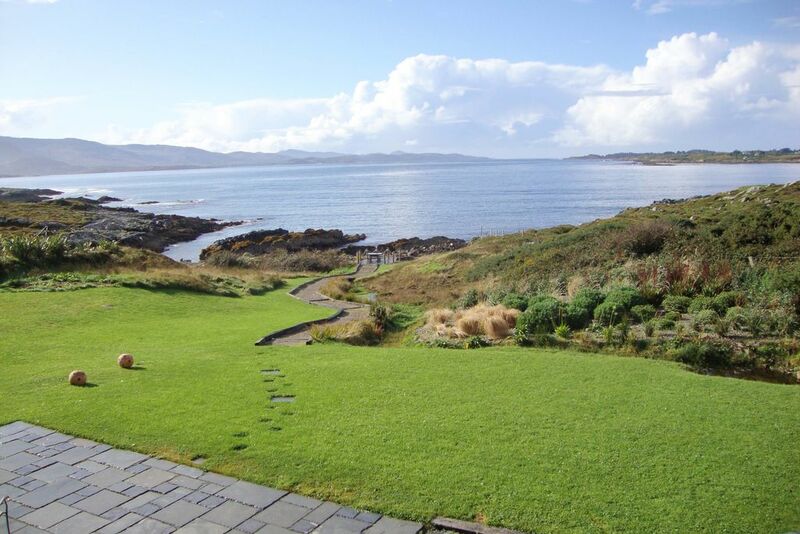 Stroll through the garden, right down to the water and dip your toes into Kenmare Bay. Look out for seals and otters swimming across the bay and the resident family of hares in the garden. Rossmore Island has also recently become home to some Red Deer. Drive into nearby Kenmare and treat yourself to a meal in one of the town's gourmet restaurants and hotels. Or stock up on delicious local produce from the local bakers, butchers and deli and from the weekly street market. Take a drive along the Beara peninsula and stop off for a pint of the black stuff and a mouthwatering crab sandwich at the famous McCarthy's Bar in Castletownbeare. Treat yourself to a day of pampering bliss at the spa at Parknasilla Hotel - just a 10 minute drive away. Afterwards, enjoy a delicious cream tea on the terrace and drink in the amazing views across the water.